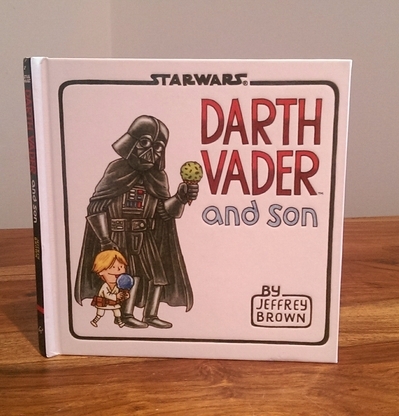 Darth Vader and Son by celebrated artist Jeffrey Brown, is my 5yr old son's favourite bedtime story. This delightfully illustrated book can be enjoyed by adults and children alike, as it follows the comical imaginary role of Darth Vader, raising his 4yr old son Luke Skywalker. What makes the book particularly special, is the hilarious situations in which young Luke lands himself in, comparable with any child's every day scenarios. Should you worry the content of this little book might be too dark for young children being that Luke's father of course embraces the dark side of the Force, fear not. Jeffrey Brown portrays Darth Vader as a caring and doting father, seen when Luke drops his ice-cream so Vader gives him his own, or when Vader places a band-aid on Luke's hurt arm. Other father and son scenarios include a visit to a rather alien looking 'zoo', trick-or-treating, interesting book reading at bedtime, and splashing around in puddles. Darth Vader: "When I was your age, we didn't even have star destroyers.."
Darth Vader: "Together we can rule the galaxy as father and son"
Luke: "And then can I have a treat?" You don't have to be a Star Wars fanatic to enjoy Darth Vader and Son, although if you are a self-confessed Star Wars enthusiast, particularly if you have children of your own, this book is a must-have. Whilst this particular story follows young Luke Skywalker's childhood journey, there is another Jeffery Brown book telling a similar tale, this time Vader raising Luke's twin sister, Princess Leia (Vader's Little Princess). I am sure Vader's Little Princess will be equally entertaining, if Darth Vader and Son is anything to go by. EricaL where did you find this fantastic book?? I must get a copy! !